Tenorin, an augmented reality (AR) Android app by KDDI, that enables users to have character models dance on their palms, was recently updated with a new MMD model that features the popular Lat. 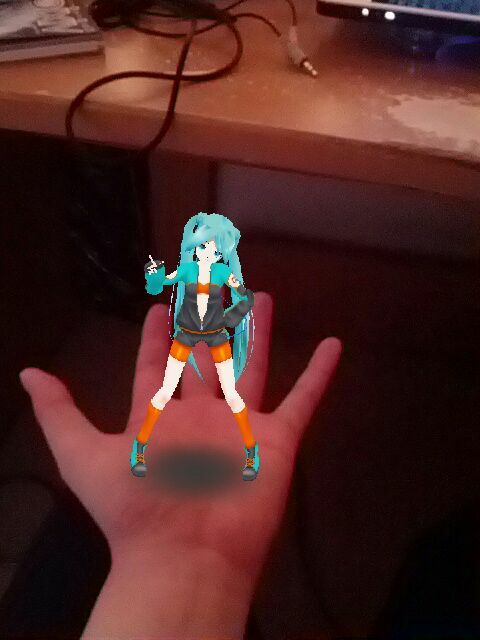 Type Miku model. The model's availablility was announced by renowned MMDPV director/creator MASATAKA, on his Twitter and Facebook page. The Lat Miku model herself (or itself?) is a winning design from a previous contest, the Tenorin Hatsune Miku Original Costume Contest in collaboration with PIAPRO. Android users may download the free Tenorin app from the Google Play Store. Once installed, users will be able to download the Lat Miku mod for free via Tenorin's Market option. MMD users may also download the model itself for usage in MMD at the Tenorin website. And now for a little showcase of how the app works on my Galaxy Nexus. 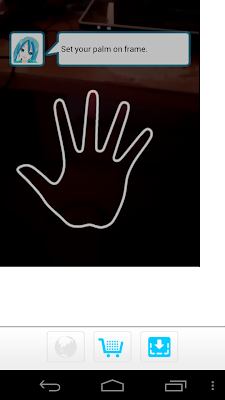 Note that the Lat Miku mod must be set as the default model first, under "Downloaded Data"
Users will first be asked to set their palms as shown on the screenshot above. 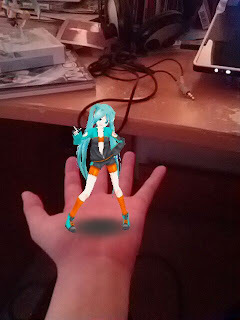 However, the palm detection may be a little fuzzy if the user's palm is not held still - Miku may disappear and re-appear all over the screen if not held correctly.